There’s a few images in this chapter used to illustrate some content. Guess from which series are the pictures taken? A few days afterward. We passed the time nonchalantly by going to hike at the grasslands, secretly going out to shop in the village, and so on. Nah really, it was all because my father said to leave the investigation to Jigen-san who stayed behind in the mansion, and in the first place, if we were to seclude ourselves and didn’t come out of the villa, then it would be more suspicious. Well, we are certainly a rich family who came here to enjoy the summer holiday fully, on the pretext of Obon Festival. So, today marked the day before when we would be returning home to the mansion. Just like how it was when we went here, returning home would naturally be a task to do for one day, so today was the last day we could leisurely enjoy our time here. The conversation that we had during when we ate the breakfast leisurely was also a normal family conversation to the end. After all, there’s no way we could afford to let Godou-san find out about it. No matter how much he has been working for my mother, it’s still not possible. This chapter is brought to you by Convallaria’s Library. If you are reading this in another site, chances are you’re reading this in a site that stole our translation. Please do not encourage content thieves and do visit our website to support this novel! Thank you. My mother declared it nonchalantly as she quickly cut into Saryuu’s words. No, no, no matter if Godou-san was here, it was still useless. Should I try to help him? Or rather, could it be that the conversation should have stopped before this? Before I could apologize, Kaa-san stopped me. I see, so it’s no good. Uu, am I that similar to Kaa-san-? Well, we are mother and daughter, after all, but still-. In front of me who was still thinking about it, Tou-san who finally recovered in one way or another, tightened his expression and turned to me. By marriage talks, to put it simply, you’re telling me not to marry Taiga-san, right? No, first of all, I don’t feel like it, since I am still a man inside. And I still have no clue when I will be a woman inside, too, perhaps I should say it like that? Well, my inside is bursting with gratitude towards my simple and doting father at this moment. Yes. My mother also has the same opinion. That’s obvious, since I’m her own child who finally returned after spending 18 years looking for me. When breakfast was over and I just left the dining room, Godou-san called me. When I thought about it for a while, ah I see, so it was a letter. After I received it and thanked him, I saw my name was written on top of the lovely white envelope. Whoa, this person, his writing is neat. As for me, it’s been 3 months ever since I began learning the alphabets, but my writing was still so-so. Minoa-san and Oriza-san glanced at me from both sides, and I understand their intention. Yes yes, even I’m also curious about the sender. Yes. When I turned the back over, there was a wax seal on it. Perhaps there would be the sender’s name written right below it. Uhm… Shikino, Taiga? An illustration on a wax-sealed letter and the sender’s name below it can be seen in this image. I asked two people to confirm it, but it doesn’t seem to be mistaken. I hope I will be able to read it moderately smoothly, since I couldn’t read the book I borrowed from my father. Putting that aside, let see. When I thought of the circumstances in the past, the fact that Taiga-san wrote me a letter might have some relation to how he said he would investigate things. If that’s the case, then Minoa-san, Oriza-san, and my brains alone won’t be enough. Probably. After sending off Minoa-san who went out of the room immediately, for the time being, Oriza-san and I returned back inside the room. After Kuon-sensei came, we properly opened Taiga-san’s letter. While I could generally read it, I read it after having some doubtful parts here and there checked by Kuon-sensei. There were some parts that used difficult words that were rarely used, nobles are so troublesome, oy. But well, to say it rudely, the Shikino household is full of suspicious things. Like how the day that Touya-san’s mother and Touka-san’s mother respectively passed away was only a few days apart. To begin with, it was also at the same period when the employees who worked at the Shikino household were replaced, and the amount of money sent to the employees who stopped as a retirement money was amazingly abundant, it was not a laughing joke. Wouldn’t it be seriously bad for Taiga-san if he were to be caught during investigating something like this? Or did I watch too many historical dramas? Kuon-sensei said that, but at any rate, since we are an outsider to his family, then we can’t carelessly meddle in their affairs. If something bad were to happen to Taiga-san with this, then… it would be my fault. Aah stop, stop, I can’t start to think about that kind of thing right now. First of all, let’s start with the information in front of me. The one who answered my question was Minoa-san. I see, so there is such a thing. If it was continued ever since the olden times, then it would mean that it recorded the house’s history. As expected-. I know that the orphanage director also had the institution’s account book—or more precisely a household account book, and he wrote in some memos about a fraction of what happened at that day in that note. …The orphanage director, huh? I wonder what is he doing in the other world as the person who shared the same name, sama face, and same voice with someone else in this world? I said that without thinking. In detective dramas, the things that can’t be let out to public office are usually written in a secret account separately from the account book, and that it’s usually saved in a safe box, that sort of thing, right? I wonder if there’s no such thing here. If Kuon-sensei’s words can be trusted, then unexpectedly, it seemed to be something within his position. Even if there’s roughly a probability that it’s kept in the safe box, in any case, the one who examined it was Taiga-san, the successor. Ah- could it be, there is such a thing inside father’s private room that I can’t enter? So, that’s the reason. Well then. Despite the fact that he has retrieved the information with much trouble, we still have nothing on our side. Since I have practiced writing, then there should be no problem in writing letters. Oriza-san said, “Ehhen!3” and puffed up her chest. As a matter of fact, she seemed to be the fastest among the three to master the plain magic language. In other words, language and composition is unexpectedly her field of expertise. When Kuon-sensei brought up the subject with a wide smile, Minoa-san quickly shook her head. She can’t be called as a muscle-head, but I can tell that she prefers to move her body around rather than reading books. At the same time, she also seemed to like putting my hair together, she’s fairly adorable. Alica-san who’s taking her days off right now is relatively a typical of maids in general. She could do her job quickly, and she’s also smart. It’s a relief to be right beside her, since it feels like she could handle everything flawlessly. Once we return to the mansion, I will properly convey the information about the things happening here. I think that she will surely be able to be helpful. Thinking of the worst scenario that the content might be read by someone else other than Taiga-san, I kept a safe content for my answer. It’s something that could give off the feelings of, ‘thanks for the interesting talk, I had fun, please let me know if there’s another opportunity to have something like that again.’ Afterward, I also touched a little about Touya-san’s marriage talks. I panicked at what Kuon-sensei pointed out. No, I didn’t intend to write it like that. Ah-, but if you read it like that, I think it’s also fine. I do not particularly dislike Taiga-san. It was not only me who reflexively nodded at Oriza-san’s line. No, actually, Kaya-san’s writing was too skillful that there were some notes that can’t be read. Since my mother’s the one reading it, I wonder if she could decipher it. Among the necessary luggage that Minoa-san and the others tossed in, there was a set of wax for my personal use. 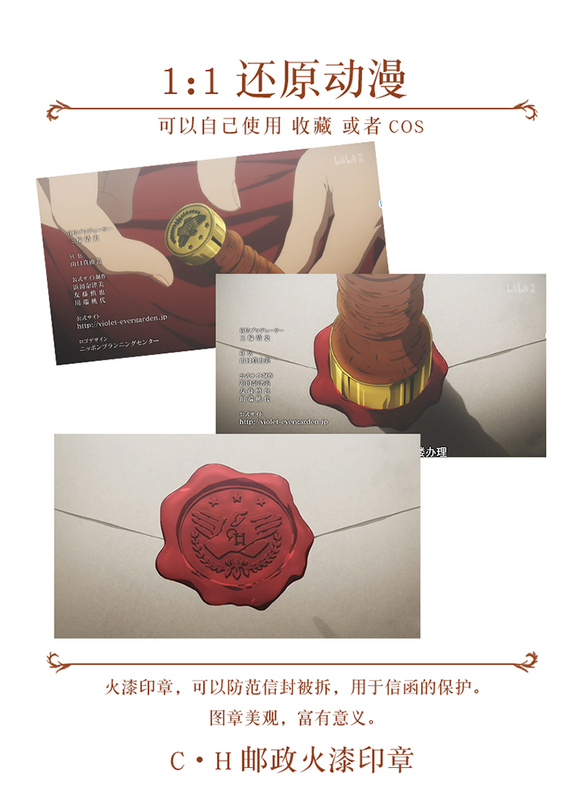 Just like Taiga-san’s letter, after we closed and glued the letter, the melted wax is to be poured over on top of it, and then a seal is pressed on top of the wax. I think it’s applied so that nobody else will read the letter in the middle of the delivery. I lit up a candle and melt the red wax. I dropped a plop of it on top of the closed envelope and quickly pushed down the seal. Also, when you remove the seal, there’s a mark resembling my name there. The seal and how it’s pressed on the melted wax to create the wax seal. Kuon-sensei, thank you for praising me honestly. Since it’s my first time, I was quite nervous for doing something like this. Normally, people don’t use snakes like Kuon-sensei when they want to deliver letters. If we were in the mansion, then we would have the employees to pass the letter to the postal service downtown, and we will ask them to deliver it after paying them. During busy time, there might be an extra charge or there’s a contingency fee that we have to pay during the time when a receipt confirmation is necessary. After I asked her as I gave some sum of money along with the envelope, Minoa-san lowered her head deeply and went out of the room. It’s fine if she wants to buy something else if there’s any change, but I wonder if it’s possible? I really can’t see how she still considers herself a man inside. She’s just in denial. It will pass. Like every other genderbent character, she’ll either accept it and move on or deny it and live in a life of discrepancy.